The Twilight Club was a dinner club in New York City that operated from 1883 until 1904. It was founded by Charles F. Wingate "to cultivate good fellowship and enjoy rational recreation." The inspiration for the club came from a dinner at Delmonico's held to honor sociologist Herbert Spencer on November 9, 1882,  prior to his departure from the United States. Herbert Spencer made a speech on this occasion in which he said, "We have had somewhat too much of the Gospel of Work; it is time to preach the Gospel of Relaxation." This motto engendered the formation of the Twilight Club. Herbert Spencer did not participate in the Club. However, Charles Wingate offered him an honorary membership, which, upon acceptance, he offered this advice to the Club, "I would, however, remark that the reports of your proceedings seem to imply rather more gravity of speech in your conversations than is altogether consistent with the 'expectation of relaxation.'" The official motto of the club was, "To cultivate good fellowship and enjoy rational recreation." An article in 1884, states, "Among all the clubs in New York, of which prominent men are members, few are not better known than the Twilight club, and, at the same time, few are more worthy of note…" While the members were "club-able fellows with $1," some dinners were "ladies' nights", where women were involved and active in the discussions. By January 1887, the Club went through growing pains and found that their membership dues of $1 per year could not cover their expenses and raised the amount to $2 per year and later to $3 per year. "Full dress was absolutely prohibited", although sometimes diners would wear full dinner dress. Instead of rules, they had principles. Additions and amendments were accepted, but they were required to be submitted in writing, along with a deposit of $17.34 (as a guarantee of good faith) two years before being voted on. There was an executive committee. However, the only officer was Charles F. Wingate, who acted as "secretary, treasurer, committee of admission, and head and doer of what ever was to be done." Wingate kept a complete list of members, which was published in a contemporaneous biography of the Club and corroborated in multiple newspaper articles at the time. Dinner began promptly at 6 and ran until 8 followed by two and a half hours of intellectual discussion. Speeches were limited to 5 minutes "with the express understanding that each orator will speak his inmost thoughts without hesitation or reserve, and with the perfect assurance of the esteem and good-will of all his listeners." During its most active period, the club met every two weeks, eight months of the year. It was called the Twilight Club because the meetings happened much earlier than other clubs in the city. Meetings could be over before other similar clubs had begun dinner. The low cost, sometimes just the cost of dinner, the early hours and the casual nature of the discussions were unique factors that led to the Club's popularity among its members. The St. Denis Hotel (also referred to as the Hotel St. Denis) became the most common location for gatherings. There was no permanent master of ceremonies. For each dinner, the secretary Charles F. Wingate would appoint one member to be the president for the night. Wingate would inform the temporary president of the program for the evening and coach him in conducting the discussion. The dining party consisted of a mixture of paid members, their guests, and invited experts who were brought in to give their testimony and opinions in reference to the topic of discussion for that evening. April 1884, D'orville's restaurant in the Mills Building. "How did you make your first dollar? & Fish and Fishing." The dinner was on the 9th floor requiring attendees to climb 215 stairs. January 1887, "Where shall we go to church in 1987?". January 1888, "What Would you do if you were King of Manhattan Island?" 300 men and women diners in attendance. June 1890, "Is it worth while to go to College? ", 80 gentlemen attended. December 1892, "What shall we do with our slums!". January 1893, St. Denis Hotel, "The American Drama", 100 ladies with their escorts attended. May 1893, St. Denis Hotel, "Who is the most remarkable man on earth? ", 52 members present. They lauded Grover Cleveland, Otto von Bismark, Kaiser Wilhelm, Pope Leo XIII. May 14, 1894, on board the steamship Paris. The 234th dinner, 400 attending. The topic "Men and Their Wives" was met with "hearty applause" and laughter. Serious talk of American commerce and shipping followed. December 1894, St. Denis Hotel. "Is the theater going to the dogs? ", 18 members of the American Dramatists' Club invited as guest speakers. December 1894, St. Denis Hotel, "What are the churches doing for the people? ", Guest speaker: Miss Ballington Booth, 200 women and men present. April 1896, St. Denis Hotel, "The Cuban question. ", 150 members and guests attended, Guest speakers: 2 NY businessmen of Cuban descent. December 1896, St. Denis Hotel, "The ethics of the bargain counter." Guest speaker: a member of the Union Labor League. January 1897, St. Denis Hotel, "As others see us." February 1897, St. Denis Hotel, "The problem of luxury - Shall we drink champagne or beer?" October 1897, St. Denis Hotel, The upcoming election was the topic. 90 club members attended. January 1901, St. Denis Hotel, "The record of the century." May 1901, "Tenement House Laws." Guest speakers: Social Reform Club & Sanitary Protective League. November 1901, St. Denis Hotel, Discussed what they would do if they were mayor-elect. 30 members attended. November 1904, St. Denis Hotel, Discussed whether Russia or Japan should be given sympathy in the present Far Eastern storm. Guest Speaker: Poultney Bigelow. Club meetings ended in the early 1900s with the last reported meeting in 1904. In 1910, Joel Benton recounts that, "The Club has held no gatherings of late years, on account of its founder's now fatally terminated illness" and "The Club, beginning in 1883, suspended 5 or 6 years ago." Waters said, "But alas! Wingate is absent, and there is no one to replace him." When Charles Wingate Died in 1909, he was noted as the founder of the Twilight Club, and its factotum. The club lasted over twenty years and hosted hundreds of dinners with guests numbering from dozens to several hundred. The last public meeting of the Twilight Club was May 19, 1918. By a unanimous vote at the annual meeting in September, the Twilight Club officially became the Society of Arts and Sciences. In 1893, the Manhattan Athletic Club went into receivership. Charles Wingate and a consortium of Twilight Club Members raised $500,000 to purchase the building as a permanent home for the club. They also intended to rent the club to other similar social clubs that could benefit from such a meeting place. While dues had been raised from $1 to $2, at the time of the athletic club purchase, Wingate mentions the initiation fee of $100 and dues of $15, which is contrasted with the dues of $30 for a similar club in London.At the time the club reported 800 members, although attendance at dinners was reported as between 50 and 200, depending on the event. The Twilight Club hoped to increase membership to 1,500 with this purchase. However, no record of a purchase or such club operations was recorded. The only noted use in this time period was for conducting boxing matches. The Twilight Club continued to have dinners mainly at the St. Denis Hotel following discussions of this purchase. Twilight Park in the Catskill region of New York was founded by Charles F. Wingate. Besides the name and a handful of Twilight Club members purchasing property there, it had no connection to the Twilight Club and its operations. The dual history of The Twilight Club has been explained by Walter Russell through The Society of Arts and Sciences and The University of Science and Philosophy. To lesser and greater degrees, the history, principles and traditions of Wingate's Twilight Club have been reinterpreted by these groups to show the Club as an early part of the Science of Man Movement. During World War I, the big social events of the Twilight Club ceased, but "the deeper spirit of the club evidenced its purpose by smaller meetings of group workers which were held together and coordinated by Walter Russell." In 1910, a new Twilight Club, under the direction of toastmaster John Francis Tucker emerged. While leaders Ralph Waldo Trine, Thomas J. Watson, Edwin Markham and Walter Russell met behind closed doors, the club continued to host huge dinners and invite discussions of current topics. In 1918, the Society of Arts and Sciences, a subgroup of the Twilight Club was formed by Thomas J. Watson and Walter Russell. Still a dinner club, they held gatherings with a celebrity to address the Society. Other functions they organized were to recognize the O'Henry Prize award winners (for the best short stories) and award gold medals. The gold medals were highly valued. The New York Times referred to them as "distinguished awards." Recipients of the gold medals included John Philip Sousa, Thomas Edison, the engineers who designed the Bronx River Parkway, actress Eva Le Gallienne, architect Cass Gilbert, and scientists Robert Millikan, Harlow Shapley, Gilbert Lewis, Albert Michaelson, and William Crocker, and opera star Grace Moore. The acceptance speeches were broadcast on network radio and covered thoroughly in the New York Times. The Society continued until 1936, when President Walter Russell had to step down to sculpt the Mark Twain Memorial which occupied all of his time. Public Relations expert Carl Byoir took over briefly. When the University of Science and Philosophy was founded in 1948, Lao and Walter Russell compiled a "Chronological Tree" to show the roots of the university in the Science of Man Movement. They listed the workers in the Twilight Club as the "Second Era" of the Movement. The University cited the beginning of The Twilight Club by referring to Herbert Spencer and his friends. Also in the founding group are such luminaries as Ralph Waldo Emerson, Mark Twain, Andrew Carnegie, Walt Whitman and others to show that there were men with similar ideas about the necessity of focus on man-building, which the University of Science and Philosophy inherited. These early associations are not documented. In 1999, the University of Science & Philosophy inaugurated a new Twilight Club claiming it to have "a vision as far-reaching as the original Twilight Club, connecting the University once again with its origin and its history." Throughout their 2000 book, The Twilight Manifesto, the University lays out a landscape of new interpretations of the Club's values and weaves this together with Walter Russell's version of the Twilight Club. "New York abounds with dinner clubs and lunch clubs, with speeches. I used to enjoy the old Twilight Club, to which the original conditions of membership, they said, were the possession of a clean shirt and a dollar - or was it a half-dollar? But after they assumed the name of the Society of Arts and Sciences, to which they had not the faintest shadow of a claim, and the purpose of which was but too obviously to induce visiting foreigners to accept invitation to speak for them, for nothing -- I have declined to meet with them." Beyond notable people, the general public had also begun to lose interest in the Society's gatherings. Before his death in 1921, John F. Tucker sent out 5000 invitations to a dinner and only received 40 acceptances. He subsequently cancelled the dinner. Reports of the Society's gatherings after Tucker's death drop off dramatically and terminate entirely in late 1922, after which the annual O. Henry Memorial Prize dinner was the only event they hosted until after Walter Russell took over the Society. During this time period, the Society began to hold contests for things such as short stories and playwriting. Of these, the O. Henry Memorial Prize for best short story became their signature contest, and John F. Tucker established a foundation for it to continue to be held annually. The O. Henry Prize committee, although under the umbrella of the Society of Arts & Sciences, operated independently from the Society. When the Society dissolved in 1936, the O. Henry Award committee continued to operate and continues to the present day. In 1927, Walter Russell assumed the Presidency of the moribund Society of Arts and Sciences. In a 1956 speech, Russell asserts, "He (Thomas Watson) and I, together with Edwin Markham had a very memorable talk one night and decided to call our new group The Society of Arts and Sciences." During this time Walter Russell affirmed that the Society of Arts and Sciences is one and the same as The Twilight Club from the 1880s. In 1930, the "American Art Directory" for which the information is supplied by the listed organizations, published an altered history for the Society of Arts and Sciences, "Founded 1882 under the name of Twilight Club for the encouragement and perpetuation of the beautiful and the useful in the arts." Walter Russell bestowed the first medal awarded by the group to Eva LeGallienne at the same time that he was installed as president on December 4, 1927. There were 400 in attendance that night at the Biltmore, and to mark the occasion, Russell presented to all 400 in attendance a print of his pencil portrait of the actress. John Philip Sousa was the recipient in March 1928. In May, the Society awarded a medal to Thomas Edison. The Society notes that this is the first award they have bestowed on a "living scientist". The sculptor who was commissioned to create the medal did not produce, so Russell did it himself, which marked a change in his career as a portraitist from oils to clay. Russell had high hopes for the Society: "I [intend to raise] money to see if I can get this society in as good financial shape as it is becoming spiritually," he wrote in 1929. By awarding medals to famous individuals, the Society was able to attract other famous or notable people to attend the awards ceremonies. 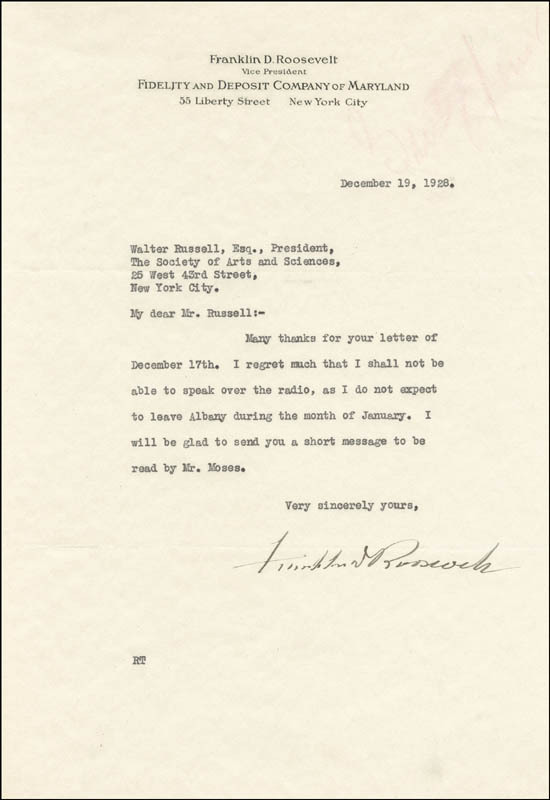 In 1928, as President of the Society of Arts and Sciences, Walter Russell received letters of regret from Herbert Hoover and Franklin D. Roosevelt, for their inability to attend a dinner in honor of Thomas Edison. Thomas Edison, also, did not attend because of illness, but his son accepted the award on his behalf. Other Medals were awarded to Madison Grant, in recognition of his construction of the Bronx Parkway, Dr, J. McKeen Cattell, Prof. Gilbert N. Lewis, Prof R. A. Milliken, Harlow Shapley and Gov. Walter J. Kohler of Wisconsin. In 1934, Russell stepped down as president because he had to devote his time to the sculpting of the Mark Twain Memorial. Under its new President public relations expert Carl Byoir, the Society appointed a long list of "regents" within their organization, each to be the expert of a particular field, similar to the well regarded but unrelated American Academy of Arts and Sciences. Walter Russell is not mentioned nor appointed a regency even though the regents was his idea. The Society of Arts and Sciences continued to give awards into 1936. Invoking the Society of Arts and Sciences and their Twilight Club Heritage, Walter and Lao Russell formed The University of Science and Philosophy in 1957. Housed at Swannanoa, a mansion near Waynesboro, Virginia, The University of Science and Philosophy sold home study courses on "Natural Science and Living Philosophy." Today the University of Science and Philosophy continues to offer home study courses and books based on the cosmogony of Walter Russell. They cite their lineage as the direct continuation of Charles Wingate's Twilight Club. The Twilight Club was re-launched in 1988 as an arm of the university. In 1956, Walter Russell gave a speech at Swannanoa at the summer gathering  to a group of students in which he presented his history of the original Twilight Club's formation. Besides the mention of Herbert Spencer's visit to the United States, the details of Russell's account show his interpretation of events differs from the usual account. The story goes all the way back to the 1870s and is one of the most remarkable stories of the greatest moral movement in history. It began when Herbert Spencer, the British philosopher, came to this country and expressed his deep worries about the human race and the dangers threatening its very existence...He really believed that civilization was doomed. He gave a very important address in New York and one in Boston outlining the reasons for his fears and stressing his deep concern for man's ability to survive in a social system which places material values before human values...At that time, however, Herbert Spencer was ridiculed and laughed at...And so Herbert Spencer went to his friends here in America, Ralph Waldo Emerson, James Howard Bridge, Richard Watson Glider, Oliver Wendell Holmes, Walt Whitman, Edwin Markham, Henry Holt, John Burroughs, Mark Twain, and Andrew Carnegie. Together these men formed a little gathering and called themselves the Twilight Club because they met at each other's houses at twilight to discuss the things that weighed heavily upon Herbert Spencer's heart. There Spencer imbued them so strongly with his idea of starting a moral movement to bring the brotherhood-of-man and love-ye-one-another principles into world human relations that it grew into a moral code which they hoped would replace every other creed and doctrine on the face of the earth...And so together they began to form this code, which was more or less completed when I came into the movement in 1895. The official history of the University of Science & Philosophy, published by the University on its webpage, perpetuates this interpretation, and the University's 2011 IRS filing states, "The purpose of the corporation is to teach, publish and otherwise promote the scientific and philosophical theories of Walter Russell and other members of the Twilight Club, which included Herbert Spencer, Edwin Markham, and Alexis Carrel." The University of Science & Philosophy is a 501(c)(3) corporation selling "home study courses, seminars & publications relating to promoting the study of universal law, natural science and living philosophy of Walter Russell. Approximately 4000 Students Served." The curriculum is "meant to be studied in the solitude and privacy of one's own home...There are no assignments, papers or examinations. Learning comes through meditative study and internalization of ideas so that these become part of one's own thinking and consequent action." The home study course costs $200, and the other 60 items for purchase on their webstore range in price from $3 to $65. At the time that The Twilight Manifesto was published, The University of Science and Philosophy Press also "emendated" The Complete Home Study Course by Lao and Walter Russell. The updated Fourth Edition "contains the additional Unit 12 with a comprehensive review of the previous units, an integral presentation of the "Russellian" science in light of the latest development in the "Neo-Russellian" research, and a further instruction on living a Cosmic Conscious life." In 2003, the University's Twilight Club became the parent to spinoff business ventures, which adopt the Russell interpretation as well. The Twilight Club as part of the University of Science and Philosophy remains mainly as an archival webpage that serves to promote the Twilight Club legacy of Walter Russell by distributing the text of the Manifesto and to redirect to the University's webpage. Promoting the Twilight Club is listed as a central mission of the University's tax filings. There are two biographies of Walter Russell. The first is by non-sectarian religious writer Glenn Clark: The Man Who Tapped the Secrets of the Universe (1946). Clark collaborated with Russell, so it is an authorized biography. The second biography is by Charles Hardy, A Worthy Messenger: the Life's Work of Walter Russell (2011). In addition, J.B. Yount II has written a biography of Lao Russell, whom he knew well: Remembered for Love: Lao Russell of Swannanoa (2004). In 1946 Walter Russell met Lao Stebbing (born Daisy Cook). Two years later, Walter Russell at 77 divorced his wife of 54 years and married the 43-year-old Lao. In 1948, using the title President Emeritus of The Society of Arts and Sciences, he moved into Swannanoa with the intention of converting the mansion into a museum of his own works. Walter and Lao would spend the rest of their lives at Swannanoa promoting their institution and its home study courses. Although the university left Swannanoa in 1998, it continues to distribute books worldwide and maintain websites. ^ a b c d e f g h i j k l m n Joel Benton (1910). Memories of the Twilight Club. Broadway publishing Company. ^ a b "Charles Wingate Obituary". The New York Times. 2 September 1909. p. 9. ^ a b "Memories of the Twilight Club". The New York Times. 5 December 1909. p. 113. ^ "Tales Told in the Twilight". Boston Evening Transcript. 9 March 1912. p. 35. ^ Cohen, Julius Henry (1946). They Builded Better than They Knew. New York: J.Messner, Inc. p. 43. ISBN 9780836923506. ^ a b c d Club Men of New York: Their Occupations, and Business and Home Addresses: Sketches of Each of the Organizations: College Alumni Associations. Republic Press. 1893. p. 42. ^ a b /ref> "and Discussion of the Slums". The New York Times. 2 December 1892. p. 2. ^ a b "If They Were Only Kings". The New York Times. 6 January 1888. p. 3. ^ a b "Is Brennan as Great as This?". The World. (New York, New York). 5 May 1893. p. 1. ^ a b c d Gilder, Jeannette Leonard and, Gilder, Joseph Benson (1886). The Critic, Volumes 5 and 8, p. 129. Good Literature Publishing Company, New York. ^ "Twilight's Spotlight is Turned on Sir Herbert". The Sun. (New York, New York). 27 March 1916. p. 4. ^ "General News". Chronicle-Express. Penn Yan New Yorg. 16 November 1882. p. 2. ^ a b c d e f g The Critic, Volume 4. The Critic Printing and Publishing Company, New York. 1884. p. 115. ^ "New York Times". 12 November 1882. p. 9. ^ Duncan, David (1908). Life and Letters of Herbert Spencer, p. 230. Methuan & Company, London. ^ a b "Page 2". Dunkirk Evening Observer. (Dunkirk, New York). 21 April 1884. p. 2. ^ a b "Membership of the Clubs". The New York Times. 17 January 1887. p. 2. ^ a b c d e Moss, Frank (1897). The American metropolis from Knickerbocker days to the present time; New York city life, p. 143. P. F. Collier, New York. ^ a b "Eating Fish on the Ninth Floor". The New York Times. 11 April 1884. p. 8. ^ Currey, Josiah Seymour (1918). Chicago: Its History and Its Builders, p. 182. S.J. Clarke Publishing Company. ^ "The Thirteen Club". The Atlanta Constitution. (Atlanta, Georgia). 9 August 1886. p. 1. ^ a b c d e Waters, Robert (1908). Culture by Conversation, p. 156. Dodd, Mead & Company, New York. ^ "How Girls Should Be Trained". The New York Times. 6 March 1885. p. 8. ^ "Ignorance and Presumption". The New York Times. 7 March 1885. p. 4. ^ "The Twilight Club Dines". The New York Times. 6 June 1890. p. 5. ^ "Twilight Club Symposium". The World. (New York, New York). 13 January 1893. p. 12. ^ New York Times, May 15, 1894,p.3. ^ "Twilight Club and the Stage". The New York Times. 7 December 1894. p. 3. ^ "City and Vicinity". The New York Times. 31 December 1894. p. 8. ^ "The Church and The People". The New York Times. 4 January 1895. p. 8. ^ "Twilight Club Discusses Cuba". The New York Times. 10 April 1896. p. 5. ^ "Bargain Counter Ethics". The New York Times. 18 December 1896. p. 2. ^ "Meeting of the Twilight Club". The New York Times. 22 January 1897. p. 7. ^ "Coming Events". The New York Times. 3 February 1897. p. 7. ^ "News Condensed". The New York Times. 5 February 1897. p. 1. ^ "Twilight Club Men For Low". The New York Times. 29 October 1897. p. 5. ^ "Twilight Club's Anniversary". The New York Times. 2 January 1901. p. 8. ^ "Tenement House Laws". The New York Times. 10 May 1901. p. 5. ^ "Twilight Club Hints for Mayor-Elect Low". The New York Times. 15 November 1901. p. 3. ^ a b "Bigelow Talks for Japan". The New York Times. 25 March 1904. p. 2. ^ Letter from Secretary Richmond J. Reese to members of the Society of Arts and Sciences, December 15, 1918. Thomas J. Watson, Sr. Papers, Associations and Clubs, Society of Arts and Sciences, Box 98. IBM Corporate Archives. ^ "A Club-House for Clubs". The World. (New York, New York). 23 November 1893. p. 10. ^ "Twilight Club's New Scheme". The New York Times. 26 November 1893. p. 17. ^ . The Day. January 9, 1889 https://news.google.com/newspapers?id=ePwgAAAAIBAJ&sjid=m3UFAAAAIBAJ&pg=5580,2919510&dq=manhattan-athletic-club&hl=en |url= missing title (help). Retrieved October 27, 2011. ^ . The Day https://news.google.com/newspapers?id=bfwgAAAAIBAJ&sjid=m3UFAAAAIBAJ&pg=1866,1657369&dq=manhattan-athletic-club&hl=en |url= missing title (help). Retrieved October 27, 2011. ^ "DILLON OUTPOINTS FLYNN. - Has Better of Hotly Contested Bout at Manhattan A.C." Select.nytimes.com. March 11, 1916. Retrieved October 27, 2011. ^ Walter and Lao Russell. The World Crisis (1958) p. 63. ^ Walter and Lao Russell, The World Crisis, pp. 74-75. ^ Walter and Lao Russell, The World Crisis (1958) p.69. ^ Alva Johnston, "Society of Arts and Sciences Plans to Extend Medal Awards," New York Times, 1929. ^ New York Times, December 1, 1941,p. 21. ^ Charles Hardy, A Worthy Messenger, p. 212. ^ a b Kimura, Yasuhiko Genku (2000). The Twilight Manifesto. Yasuhiko Genku Kimura & The University of Science & Philosophy. ISBN 1-879605-66-X. ^ "Twilight Club to Dine Tardieu". The New York Times. 21 April 1918. p. 26 – via Newspapers.com. ^ "Dinner to Charles M. Schwab". The New York Times. 13 November 1918. p. 13 – via Newspapers.com. ^ "'Get Down to Tacks' is Colby's Warning". The New York Times. 29 January 1918. p. 11. ^ "Sisson Doubtful on Tariff". The New York Times. 3 March 1921. p. 32. ^ "Society of Arts to Dine Stage Stars". The New York Times. 17 April 1921. p. 36 – via Newspapers.com. ^ "Tribute Paid to Frohmans". The New York Times. 25 April 1921. p. 9. ^ "Society of Arts to Dine Belasco". The New York Times. 10 December 1921. p. 11 – via Newspapers.com. ^ "A Night With the Humorists". The New York Times. 13 April 1922. p. 24. ^ "Favors Russian Trade". The New York Times. 23 November 1922. p. 3 – via Newspapers.com. ^ Gilman, Charlotte Perkins (1935). The Living of Charlotte Perkins Gilman: An Autobiography, p. 313. The University of Wisconsin Press, Wisconsin. ISBN 0299127443. ^ "John F. Tucker Dead". The New The New York Times. 1 March 1921. p. 13. ^ "Cobb Wins O. Henry Prize". The Cincinnati Enquirer. Cincinnati, Ohio. 1 April 1923. p. 12. ^ "About Plays and Players". The Evening World. New York, New York. 3 January 1920. p. 16. ^ Williams, Blanche Colton, Hansen, Harry, Brickell, Herschel, Engle, Paul, Poirier, Richard, Abrahams, William Miller (1922). Prize Stories...The O. Henry Awards, p. vii. Doubleday. ^ Jack Edward Shay (13 June 2012). Bygone Binghamton: Remembering People and Places of the Past. AuthorHouse. pp. 218–. ISBN 978-1-4670-6502-3. ^ a b "Plan Now for New Homes in Suburb Areas". OshKosh Daily Northwestern. Oshkosh, Wisconsin. 26 January 1934. p. 17. ^ a b "America's Greatest Danger". The Oneonta Star. Oneonta, New York. 10 November 1934. p. 4. ^ American Federation of Arts (1930). "American Art Directory, Volume 27, p. 238. R.R. Bowker, Michigan. ^ "Sousa Given Medal". Reading Times. Reading Pennsylvania. 16 February 1928. p. 12. ^ "Edison Awarded Medal". The Bee. Danville, Virginia. 4 May 1928. p. 14 – via Newspapers.com. ^ Clark, Glenn, The Man Who Tapped the Secrets of the Universe, p.17-19. ^ "Will Attend Edison Dinner". Lebanon Daily News. Lebanon, Pennsylvania. 2 May 1928. p. 15. ^ a b "Son Accepts Gold Medal for Edison". Reading Times. Reading Pennsylvania. 25 May 1928. p. 1 – via Newspapers.com. ^ "Bronx Parkway Wins Art Society Medal For Builder". The Kingston Daily Freeman. Kingston, New York. 28 January 1929. p. 2. ^ "Scientists are Awarded Medals". Times Herald. Olean, New York. 12 March 1930. p. 8. ^ "Scientists are Awarded Medals". Times Herald. Olean, New York. 19 April 1930. p. 4. ^ "Harlow Shapley Given Medal". The Crimson. Cambridge, Massachusetts. 25 March 1931. ^ "Company Houses". The Daily Messenger. Canandaigua, New York. 10 February 1934. p. 6. ^ "Kohler is Awarded Fellowship". Freeport Journal-Standard. Freeport, Illinois. 29 January 1934. p. 2. ^ a b "Robertson Winds Recognition By National Society". The Daily Herald. Provo, Utah. 20 September 1935. p. 5. ^ a b "Burnett Shryock Honored by Society of Arts And Sciences". The Daily Free Press. Carbondale, Illinois. 12 October 1935. p. 1. ^ "Three Warrenites Are Signally Nonored By N.Y. Society". Warren Times Mirror. Warren, Pennsylvania. 17 October 1935. pp. 11, 20. ^ "Distinguished Service". The Kingston Daily Freeman. Kingston, New York. 6 March 1935. p. 8. ^ "3 Provoans Win Membership In Society of Arts, Sciences". The Daily Herald. Provo, Utah. 4 October 1935. p. 1. ^ "Art Society Honors Former Onward Man". Logansport Pharos-Tribune. Logansport, Indiana. 21 October 1935. p. 10. ^ "Young Gets Award". The North Adams Transcript. North Adams, Massachusetts. 17 March 1936. p. 1. ^ "Chosen For Medal". Middletown Times Herald. Middletown, New York. 17 March 1936. p. 7. ^ "Tonight's Program". Times Herald. Olean, New York. 20 May 1936. p. 3. ^ "Young Receives Gold Medal". The Express. Lock Haven, Pennsylvania. 26 May 1936. p. 7. ^ "Mansion On Hilltop Dedicated To Unity". Statesville Record & Landmark. Statesville, North Carolina. 2 July 1949. p. 16. ^ "Washington International". Archived from the original on 2011-06-10. ^ "Council Issues New Travel Guide". The Progress-Index. Petersburg, Virginia. 29 April 1953. p. 2. ^ The University of Science & Philosophy. "The University of Science and Philosophy, History". ^ a b "The University of Science and Philosophy IRS Form 990" (pdf). ^ "NCCS Organization Profile - University of Science and Philosophy". ^ "University of Science and Philosophy - About". ^ "University of Science and Philosophy - Products". ^ "Store". The University of Science and Philosophy. This page was last edited on 11 January 2019, at 00:03 (UTC).